The ABC School of Florence has been teaching the Italian Language and Culture to students from all over the world since 1982. In all these years we have improved our offerings to better face the real needs of our students. The ABC School of Florence carries out research in the field of linguistics and pedagogy according to the “Direct Teaching Method”: from the first day on, in all levels, only Italian will be spoken. Students are encouraged to practice verbal communication with their teachers so that they may learn Italian naturally, increasing their knowledge quickly and with confidence. With their teacher students practice their spoken Italian in real-life situations. Classes of maximum 8 students, a wide range of courses (Standard or Intensive courses for beginners, intermediate and advanced levels, professional courses, cultural courses and art courses, preparation for exams...), interesting and enriching activities conducted by our teachers, visits to museums and churches in Florence with our teachers who are also licensed tour guides and its position in the heart of Florence make of the ABC the ideal school to study Italian. "Egy csodálatos élmény, mindenkinek meg kell tennie"
Az Europass a legjobb hangulatú és legélettel telibb nyelviskola Firenzében! Otthonos hangulata, a barátságos és informális tanítási stílus, és a tény, hogy a világ minden részéről ideérkező barátokkal vagy körülvéve, mind könnyűvé és szórakoztatóvá teszik az olasz tanulást. Firenze teli van titkos kis felfedezésre váró helyekkel, amelyeket csak akkor találhatsz meg, ha eltöltesz itt egy pár hetet. A folyamatos segítséggel, amit tőlünk kapsz, és az újonnan szerzett olasz tudásoddal, belemerülhetsz az igazi olasz életstílusba és igazán felejthetetlen élményben lehet részed. The school, which owes its name to Michelangelo's famous sculpture, was set-up in 1983, it is officially authorized by the Italian Ministry of Education and it is open all year round. It is situated in the heart of the historical center of Florence, on the third floor of a bourgeois palace (with a lift) built at the end of the 19th century and recently renovated. It is located in the area that houses banks and worldwide famous fashion shops. The Cathedral, the railway station, the main monuments and museums are all within walking distance (5-10 minutes walk) from the school. All the rooms are provided with air conditioning, they are spacious and bright with big tables and comfortable chairs. All that is necessary has been provided so that the students can feel comfortable and energetic during their lessons. The school is provided with a wireless connection which the students can use for free. 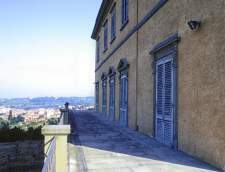 On the top floor of the school, there is a wonderful terrace, from which the students can enjoy a breath-taking view of Florence. All the teachers are Italian mother-tongue speakers and have a degree. Classes have a maximum of 12 and a minimum of 4 students, the average number of learners per class is 7/8. The school offers a various and interesting program of leisure activities, about 20-30 per month. 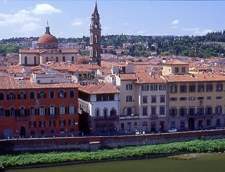 The school offers students and a free accommodation search for any kind of request and for the duration of the stay in Florence. 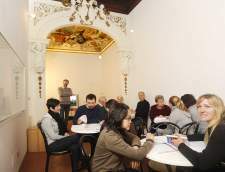 The school offers various courses of Italian language and culture. Group courses from 2 to 6-hour lessons per day, lessons for couples, lessons for scholastic groups, individual lessons, combined courses of Italian, Art History, Italian business, Italian cooking, Italian fashion, Art and Crafts, combined courses with an internship, summer courses. The courses of Italian language are divided into six levels of language competence. Classes have a maximum of 12 and a minimum of 4 students, the average number of learners per class is 7/8. All the teachers are Italian mother-tongue speakers and have a degree. 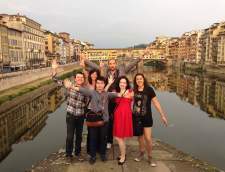 Learn Italian & live in your private teacher's home around Florence with Home Language International! Home Language International (HLI) is a family-run business offering language courses in more than 20 languages in over 30 countries worldwide, including Italian lessons at an experienced private teacher's home in Italy. More than 5,000 students take advantage of our services every year. Ian Josephs, Danielle Josephs, their 5 adult children and an expert team of dedicated staff all put in very long hours for HLI. 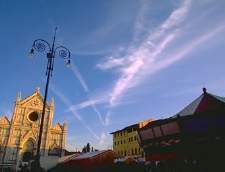 You stay in an experienced teacher's family home, have one-to-one Italian lessons and then continue to use the language during the rest of your stay in Florence. Because you are the only student, you are guaranteed individual attention. The lessons are completely designed for you, so the teacher will focus exactly on what you need. Mealtime conversation, television and social contacts are all in Italian. All of our teachers in Italy have a university degree (or equivalent) and/or a recognised teaching certificate. All teachers have been visited by one of our local organisers. Their qualifications have been checked and their homes throughly inspected. During your stay in Florence, a local organiser will monitor your progress and make sure your experience is both happy and successful. Home Language International (HLI) is accredited by the Accreditation Body for Language Services (ABLS), Association of Language Travel Organisations (ALTO), and UNOSEL. 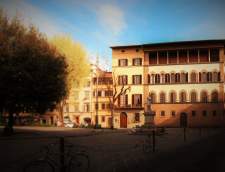 The language school in Florence is situated in a 16th century Renaissance palace in the middle of the Tuscan metropolis. You can really feel the artistic aura. Even in the classrooms, there are frescoes on the walls that remind you of where you are: in the cradle of the Italian Renaissance with its famous representative, the wonderful Michelangelo. 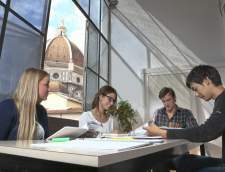 The language school in Florence has been offering students from all over the world the perfect framework for learning Italian, the language of fine arts, since 1957. Thanks to the many years of experience, a wide range of teaching material and equipment is available to help you learn: A well-equipped library, a modern technological infrastructure with audio and video teaching material, and wi-fi throughout the premises are all services that the students appreciate. Ahogy a diákok megérkeznek Firenzébe, elsőként elmennek a kijelölt szállásukra, vagy a családokhoz, akiknél megszállnak. A szállás címét előre megküldjük a diákoknak vagy a küldő intézménynek/irodának a lakás tulajdonosának/családnak a telefonszámával együtt, és egy extra telefonszámot, amit vészhelyzet esetén lehet hívni. Ha valamelyik diák késik, kérjük, hívja fel e telefonszámok egyikét, és értesítse a szállást/családod a késésről. Az iskola szombaton és vasárnap zárva van. Az iskola Firenze ősi városközpontjának szívében, egy épület második emeletén található. Az iskolában található egy közösségi pihenő tér, ahol a diákok találkozhatnak egymással szünetben és tanítás után, és egy könyvtár könyvekkel, DVD-kkel, egy zongorával és internet sarokkal. 16 légkondicionált tantermeink fel vannak szerelve projektorral és ingyenes wifi eléréssel. A diákszálló az iskola területén található. The Leonardo da Vinci school is located in an historical palazzo, situated in the heart of the city of Florence, with a magnificent view of the Cathedral. From here you can reach the most beautiful and famous places in the city in only few minutes walk. Our school occupies an entire building of 3 floors and with 15 spacious and light classrooms. The first floor is dedicated to recreational activities, where you can read the paper, have a coffee with your friends and do your homework. On the first floor there are the classrooms, the secretary and the multimedia classroom with free internet service. Scuola Leonardo da Vinci offers a wide range of high-quality Italian language courses, conceived for any level, from beginner to advanced, all the year round! Courses start every Monday except for beginners and students can stay for 1 week only as well as for many weeks and months. Our school organizes interesting leisure activities every week during afternoon and evening. Our 40 years of experience make us a well-established and reliable reality in the world of language schools. 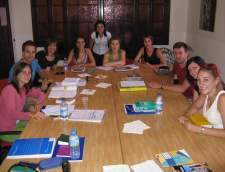 We are very proud of our professional and friendly staff, who do their best to make every student's stay unique in terms both of language learning and of cultural experience. Our teaching method is influenced by modern didactics and is designed according to the 'Concept of Foreign Languages' of the European Council and the guidelines of the ''Accademia Italiana di Lingua (AIL)". We follow a communicative method: from the first day of lessons and at each ability level, only Italian is spoken in class. We put particular emphasis on spoken language and on communication, but also deal with the 4 base abilities (reading, writing, oral comprehension and speaking). Lessons are interesting, interactive and also fun, organized in a relaxed atmosphere in which learning is done naturally. Text books are supported by authentic material, like newspapers, magazines and video, that facilitate learning about contemporary Italy and the many different aspects of Italian culture. Our teachers, experts in teaching Italian to foreign students, are there for the students, to guide them, motivate them and help them in their learning. In addition, through the years Scuola Leonardo da Vinci has developed its own teaching method. The books have been conceived for speeding up the learning process of Italian language. Grammar is presented in a logic and organized way, followed by examples and a wide range of practical exercises and short stories that give both students and teachers many opportunities for making conversation in Italian language. All the programmes have been thought in order to reach your goals, independently from the duration of the course. Having a deep knowledge of Italian grammar (through the continuous practice of writing, reading and speaking in real situations) is the principle which Scuola Leonardo da Vinci’s method is based on. Where else should you learn Italian than in the city that gave birth to fine arts - and where eating typical Tuscan dishes and local sourced produce in Trattorie is as good as it gets? We highly recommend you opt for InFlorence Academy, the first language school established in Florence, located in a 16th Century building that strongly evokes the Renaissance period. The school is surrounded by world famous sights, the cosiest of cafés and most intriguing of markets. Crossing the Ponte Vecchio to get your daily dose of Italian gelato and espresso will be just one of the many things you will do while experiencing Florence’s artistic ambience. Centro Fiorenza - International House Florence is located in a city deeply rooted in artistic tradition. The school offers a variety of courses tailored to students' needs and arranges cultural and social activities including excursions to other cities in Italy. There are several accommodation options available including homestay and shared student apartments. Classes at IH Florence are limited to 10 students, which allows the teaching staff to provide more personal attention to students. Centro Fiorenza has been accredited by the University for Foreigners of Siena and is now an official examination center for the CILS certification. The CILS certification is a diploma officially recognized by the Italian Ministry of Education and is based on the Common European Framework of Reference of the Council of Europe. The CILS certification attests to the student’s degree of linguistic and communicative competence in Italian as a second language. Examination fees vary according to the level. The application needs to be effected 40 days before the exam date. Exams take place in June and December. Intenzív olasz nyelvi kurzusokat a Galilei Intézet, Firenze kimondottan azoknak, akik csak kis időt tanulni, és szeretné a legtöbbet kihozni belőle:-magán emberek minden korosztály számára, akik tanulni olaszul, azok személyes szükségleteinek kielégítésére, vagy a szenvedély-nyelvi diákok, akik kell készítenie a saját olasz vizsgák-üzleti emberek, akiknek szükségük van az olasz nyelvű munkaAz egyéni tanfolyamok egyéni tanulmányi programok, amelyek a szükségleteit a nyelvi és a profil minden diák, figyelembe véve saját nyelvi háttere, a kor, a motiváció és a tanulás szerkezete jellemzi. Így,-a ' lehetséges fókuszál is különösen a nyelv, mint a nyelvtan, beszélgetést, kiejtési stb és/vagy felvenni a szókincs a olasz nyelvet használja a munka / tanulmány.A nyelv tanulás, az a tény, hogy folyamatosan követni egy tapasztalt tanár és gyakorló olasz struktúrák aktívan ebben az időszakban lehetővé teszi, hogy gyorsítsa fel sokat a sebesség-ból tanulás. Egy hét az egyhez tanfolyamaink körülbelül egy hónap, egy normál méretű csoport osztály felel meg. A tanulmányi program fejlesztése, a napi eredmények szerint.Egyhez olasz nyelvtanfolyamok indítása, és befejezni a kért napon. Kérésre a tanfolyamok folytatása is a hétvégén és ünnepnapokon annak érdekében, hogy teljes mértékben kihasználják a firenzei tartózkodása.A TANÍTÁSI MÓDSZER, SZEMÉLYRE SZABOTT PROGRAMOKKAL:--A tanuló nyelvi szükségleteinek és jellemzőinek értékelése. Szerint a hallgató profil döntés arról, hogy előnyben részesíti a társalgási vagy műszaki szintaktikai megközelítést a tanítás;--Egyéniesedés-a hallgató személyes érdekeit, annak biztosítására, hogy a tanfolyam tartalma (tantárgyak, olvasmányok, írások, beszélgetések, stb) a saját érdeklődése, amely segít, hogy megkönnyítsék a folyamat a tanulás;--Választéka a legmegfelelőbb eszközök és a módon való felhasználása, például társalgási, audiovizuális anyagok, cikkek, újságok vagy vélemények, stb. ;--A tanulási folyamat ellenőrzése: kis teszt, csoportos beszélgetés, végzett gyakorlatokat annak érdekében, hogy az eredményeket a tanulás különböző szakaszaiban, és dönt a pontos folyamatos tanulás program;--Értelmezése az elért eredményeket, így a hallgató tudatában a mi ő birtokol tanult.LÉTESÍTMÉNYEKAz iskolánk szobákban légkondicionáló, audió-vizuális rendszert, sztereo felvétel a létesítmények és a számítógép, a gyakorlatban a nyelvtan, és összeköt-hoz Internet. The Centro Toscano di Lingue e Cultura believes that the study of language enhances communication, understanding and knowledge and that language and culture are inseparable. We are dedicated to the concept of intercultural exchange through language with the intention to provide deeper cultural understanding and awareness through our language teaching. Therefore, we are committed to offering a range of services that encompass our vision. We believe that language teaching and learning and cultural understanding go beyond the textbook and the classroom, and we seek to provide authentic experiences that will impact individuals as students, future teachers and world citizens. Our goal is to instill a capacity for cultural sensitivity that transcends individuals' experiences at The Learning Center of Tuscany. Our hope is that this will become and remain fundamental in many aspects of their lives, including career, relationships, travel, and understanding of their individual role in a global society. Ön akár diák, üzletember vagy utazó Firenzeben van az Ön számára megfelelő nyelvtanfolyam. Minden szint és korosztály számára elérhetőek a nyelvtanfolyamok, bármilyen időtartamban. Csak válasszon egy nyelvtanfolyamtípust a lenti listából és fogjon hozzá.